Despite the misleading name, this train game flies straight and true to its reels, giving you the opportunity to win a randomly awarded jackpot! This exciting potential winning adds spice to the already fun graphics and bonus features on this RTG Loose Caboose slot game. Whilst the title of this RTG online slot keeps making me sing that Scottish voiced UK advert for Wine Gums, "There's a moose loose aboot this hoose," there's a lot more to enjoy in this Loose Caboose slot than sticky sweets in the shapes of alcoholic beverages that made you feel very grown up in school, snacking on them after the boys had run after you in the playground shouting "cooties." Now, for those of you not in the know, Google has reliably informed me that a Caboose is a railway wagon with accommodation for the train crew, typically attached to the end of the train. Google also wanted me to know that back in the good old days, before everything went online, it meant a kitchen on a ship's deck. 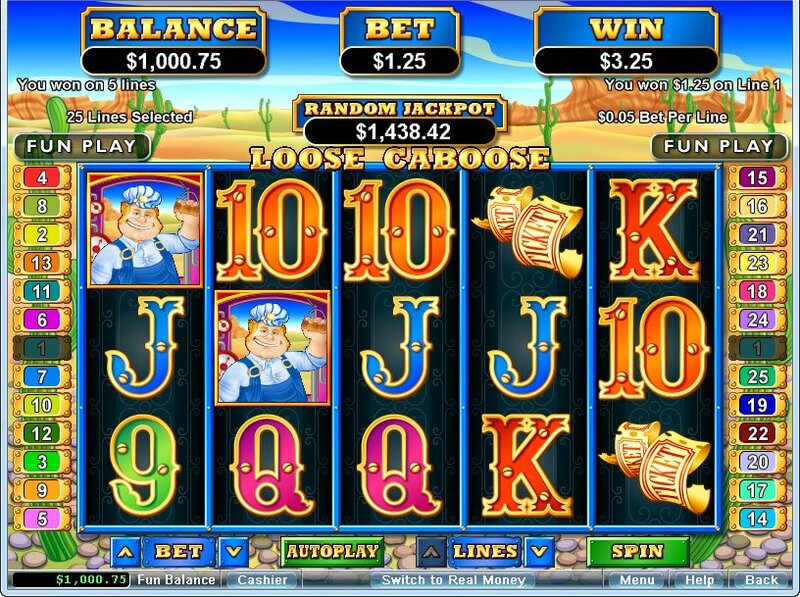 Graphics are bright and cheery, just like the characters in the Loose Caboose slot game from RTG. We have a pretty blue tan engine, the first steam carriage of the train on the loose, a well to do lady passenger, complete with hat and pretty pink bow, and the ticket master, conductor smiling cheerily, and tickets curled up next to a jewel filled handbag. 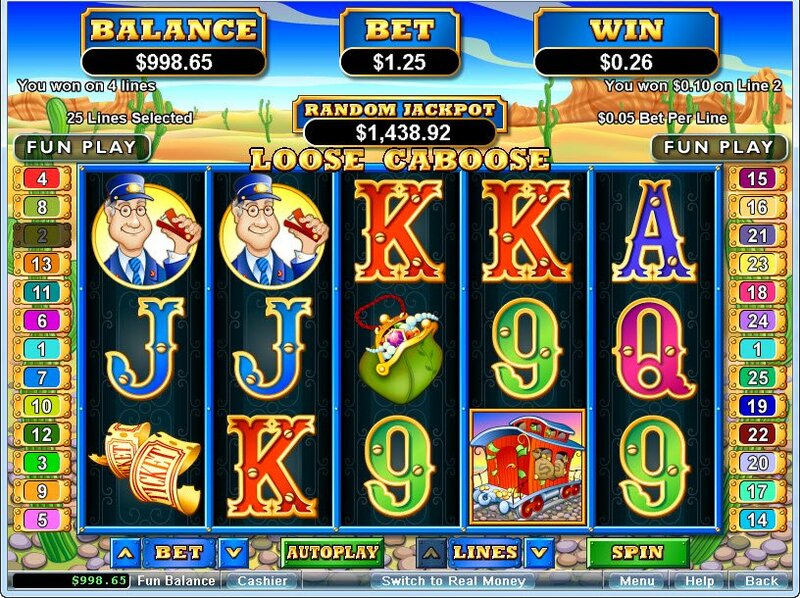 Is this a great train robbery, or a simply Loose Caboose slot jackpot 5-reel, 25 payline slot game? The Caboose symbol itself is our scatter symbol, and any wins with this red carriage will be multiplied by the total bet. 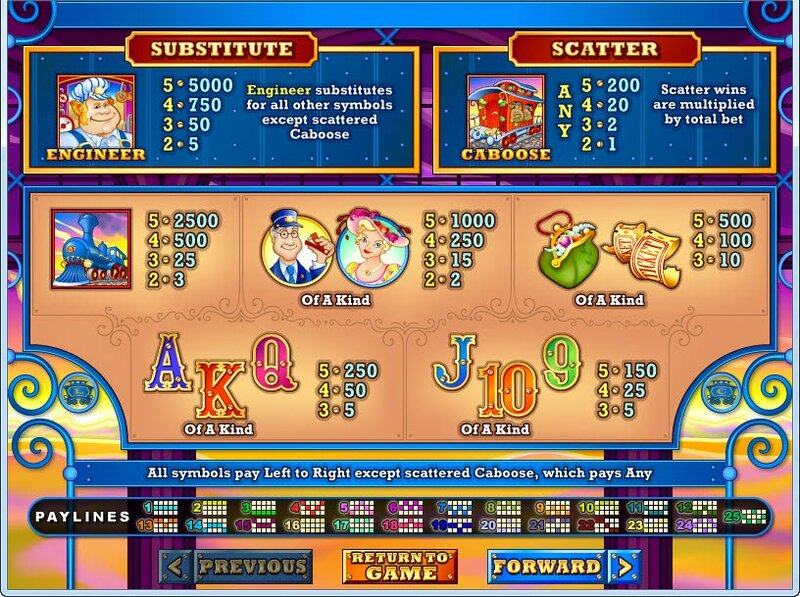 Three or more caboose carriages will trigger The Cash train, Loose Caboose slot bonus game feature, to give you free spins. This is after it moves across the reels, opening up winning lines wherever it goes, not to mention bonus symbols and multipliers.